میرزایی, محمدرضا, محمودی, مهدی, حاجی زاده, محمدرضا, بگرضایی, فهمیده, اکبرپور, وجیهه, بهرام آبادی, رضا. (1396). بررسی تأثیر کورکومین (زردچوبه) بر بیان ژن‌های OCT4،Nano و Nucleostemin در رده سلول سرطانی AGS (آدنوکارسینومای معده). 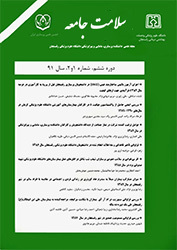 سلامت جامعه, 8(2), 19-27. محمدرضا میرزایی; مهدی محمودی; محمدرضا حاجی زاده; فهمیده بگرضایی; وجیهه اکبرپور; رضا بهرام آبادی. "بررسی تأثیر کورکومین (زردچوبه) بر بیان ژن‌های OCT4،Nano و Nucleostemin در رده سلول سرطانی AGS (آدنوکارسینومای معده)". سلامت جامعه, 8, 2, 1396, 19-27. میرزایی, محمدرضا, محمودی, مهدی, حاجی زاده, محمدرضا, بگرضایی, فهمیده, اکبرپور, وجیهه, بهرام آبادی, رضا. (1396). 'بررسی تأثیر کورکومین (زردچوبه) بر بیان ژن‌های OCT4،Nano و Nucleostemin در رده سلول سرطانی AGS (آدنوکارسینومای معده)', سلامت جامعه, 8(2), pp. 19-27. میرزایی, محمدرضا, محمودی, مهدی, حاجی زاده, محمدرضا, بگرضایی, فهمیده, اکبرپور, وجیهه, بهرام آبادی, رضا. بررسی تأثیر کورکومین (زردچوبه) بر بیان ژن‌های OCT4،Nano و Nucleostemin در رده سلول سرطانی AGS (آدنوکارسینومای معده). سلامت جامعه, 1396; 8(2): 19-27. می‌تواند بستری برای مطالعات گسترده‌تر در خصوص تأثیر ضد سرطانی این ترکیب گیاهی باشد. Introduction: Curcumin is the natural yellow pigment in turmeric isolated from the rhizome of the plant Curcuma longa. Curcumin inhibits formation and invasive cancer cells and destroys cancer cells resistant to chemotherapeutic drugs. The purpose of this study was the survey of effects of different concentrations of alcoholic curcumin on the OCT4, Nanog and Nucleostemin genes in the AGS (gastric adenocarcinoma) cell line. Material and Methods: The AGS cell line was cultured in RPMI-1640 (Gibco), supplemented with penicillin/streptomycin (100 U/ml and 100 lg/ml, respectively) and 10% fetal bovine serum, at 37Â°C in a humidified atmosphere of 5% CO2. in 60â70% cell confluence, the cells were treated with Curcumin Cocentration (20,40, 100) Î¼l and incubated for 24,48 and 72 hours. Finally, total RNA werecextracted and cDNA were synthesized and the expression of mentioned genes was detected. Results: expression rate of OCT4A, OCT4B, NANOG and Nucleostemin (GLN3) at concentrations less than 20 Âµg/ml were reduced but OCT4B1 expression showed increased by hours respectively. Conclusion: The results showed that curcumin inhibited cell division, also, this study could be the basis for more extensive studies on the anti-cancer effect of the combined plants.